[IN]Place EverBind Heavy-Duty View and OfficeMax Durable View Binders, $9.99 ea. Duracell Copper Top Batteries (AA or AAA) 20 pk., $16.99 ea. Avery 5160 White Mailing Labels (3,000 ct.), $26.99 ea. Post-it 3×3 Canary Pop-up Super Sticky Notes (10 pk. ), $16.79 ea. 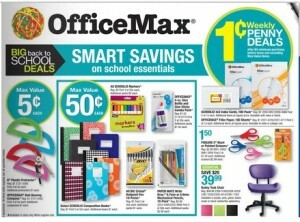 Select OfficeMax 1,3 or 5-subject Poly Notebooks, $3.50 ea. Fiskars 5″ Blunt or Pointed Scissors, $1.50 ea. after you buy the post-it for 1 cent with rewards, you have coupon from ad to get a free bag.